Prior to the Civil War, the Dismal Swamp Canal and the Albemarle and Chesapeake Canal allowed boats to get from the Roanoke River and the Chowan River to Norfolk. Despite the railroad competition, they have remained in business. In 1895, multiple railroads and two canals connected Portsmouth and Norfolk to the hinterland in the Coastal Plain and far beyond, into the Piedmont and Appalachian Plateau coal fields. The Portsmouth and Roanoke Railroad (yellow line, above) built the first track to bring freight and passengers to Portsmouth, connecting to the Roanoke River at Weldon in 1837. Tobacco and other products being floated down the river no longer had to take the slower route via the Dismal Swamp Canal. By 1895, it was part of the Seaboard Air Line. 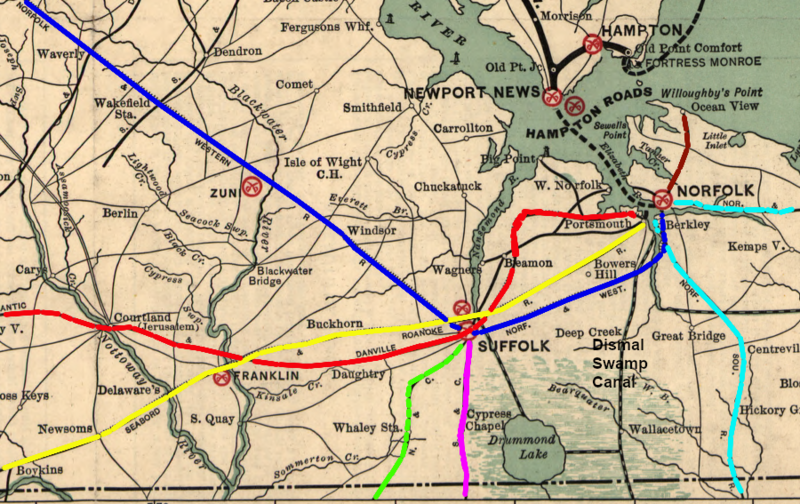 The Norfolk and Petersburg Railroad (blue line, above) was completed in 1858, after overcoming resistance by Petersburg and Richmond business leaders to getting a charter and financing. In 1895, it was known as the Norfolk and Western Railroad. The Atlantic and Danville Railroad (red line, above) intercepted the Roanoke River trade much further upstream from Weldon. It paralleled the Virginia-Carolina border west to Emporia and ultimately reached Danville in 1891. Passenger traffic was significant, in addition to freight. Two rail lines carried tourists from Norfolk to resort areas. The Norfolk and Ocean View Railroad (brown line, above) took vacationers north to Ocean View on Willoughby Spit, on the shoreline of the Chesapeake Bay. The Norfolk Southern Railroad (light blue line, above) carried vacationers due east to the Virginia Beach resort area on the Atlantic Ocean, while other track brought agricutural procucts from North Carolina into Norfolk. In 1895, Norfolk and Portsmouth were major transportation centers due to railroads, canals, and shipping terminals on the Elizabeth River. Today, four railroads service the shipping terminals in Hampton Roads where cargo is loaded/unloaded from ocean-going vessels: the Norfolk Southern, CSX, Commonwealth Railway, and the Norfolk and Portsmouth Belt Line Railroad. 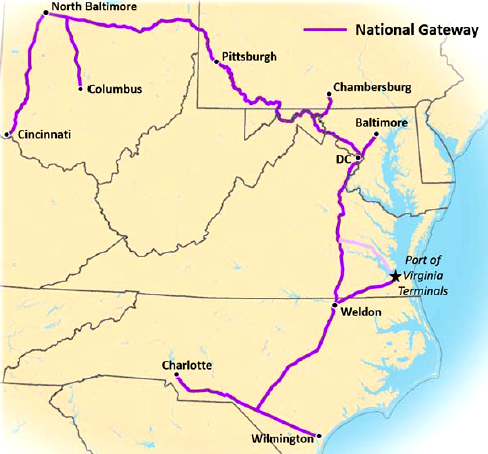 The Commonwealth Railway and the Norfolk and Portsmouth Belt Line Railroad are short-lines that link Hampton Roads terminals to the long-distance Class 1 freight railroads (Norfolk Southern and the CSX) and to two other short-lines in the region (Bay Coast Railroad and the Chesapeake and Albemarle). Since the 1830's, railroad and port development have been closely intertwined. 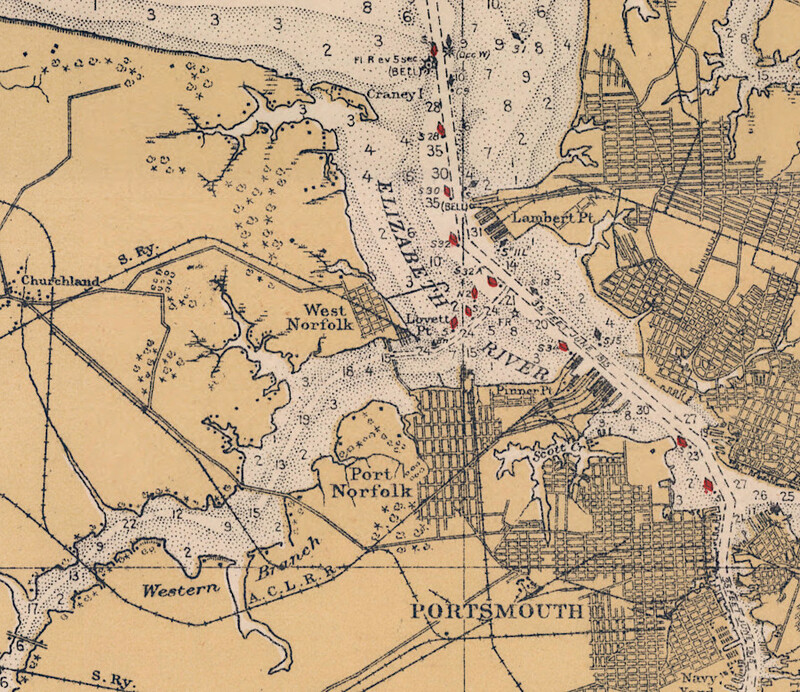 Portsmouth grew at the expense of Petersburg, after the Portsmouth and Roanoke Railroad connected the Hampton Roads port to traffic floating down the Roanoke River. The port at Newport News was spurred by the decision of the Chesapeake and Ohio Railroad to build a new line and send its coal to docks located downstream from Richmond, in order to access a deeper channel. The Commonwealth of Virginia has funded rail improvements for the state's shipping terminals, including some projects as far away as the West Virginia border, to improve service and reduce truck-related delays. Due to decisions that date back to the 1800's, the CSX and Norfolk Southern railroads have different levels of access to different shipping terminals. Norfolk Southern has control over rail access at the Virginia Inland Port (VIP), plus a competitive advantage at Norfolk International Terminal (NIT). CSX has control over rail access to the Newport News Marine Terminal (NNMT), plus a competitive advantage at the Portsmouth Marine Terminal (PMT) and the Richmond Marine Terminal (RMT). 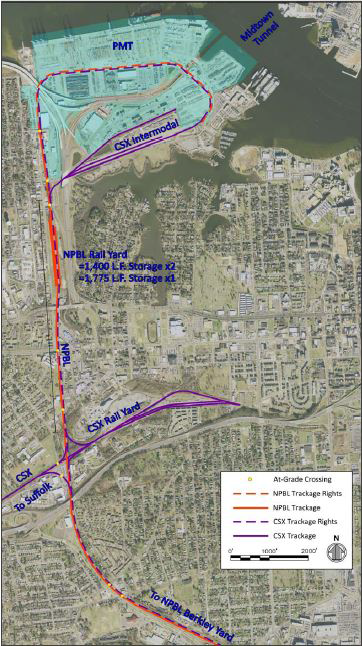 Rail access at the Virginia International Gateway (VIG) is equitable. The Commonwealth Railway brings all loaded rail cars from the terminal to a marshalling yard in Suffolk. CSX and Norfolk Southern have equal opportunity to hook their locomotives to trains there. 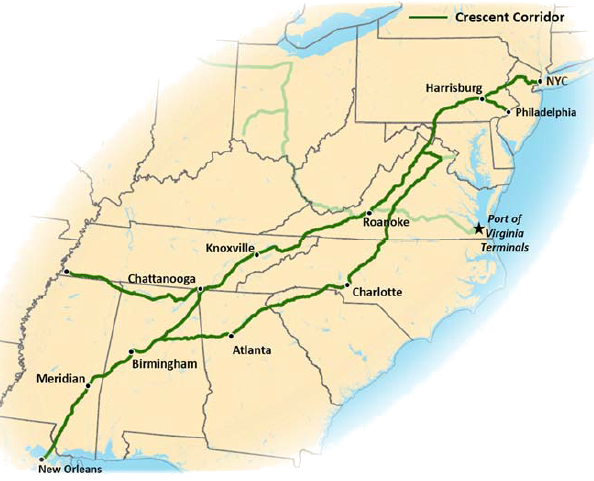 The Heartland Corridor project enlarged Norfolk Southern tunnels through mountains in Virginia/West Virginia, facilitating traffic headed west from Norfolk and Portsmouth. Removing the physical constraints of the narrow, low tunnels enabled the Norfolk Southern "double-stack" the rail cars in Hampton Roads. Putting one container on top of another doubled the number of containers a train could carry between Norfolk and Columbus (Ohio), and to Chicago. Norfolk Southern trains can also carry cargo via the Crescent Corridor to the Virginia Inland Port and other destinations to the south in Tennessee and North Carolina. Government funds have also improved the CSX National Gateway, primarily to enhance north-south transport. Faster transport by rail, both at the port and inland, have made the Port of Virginia terminals more competitive against rivals at Savannah, Charleston, Baltimore, and New York/New Jersey. Virginia even contributed $24 million to upgrade the Virginia Avenue rail tunnel in Washington, DC. The CSX National Gateway project, including the Kilby Rail Yard in Suffolk, also enhanced access to Virginia's ports. CSX stopped offering intermodal service to the Newport News Marine Terminal (NNMT) at the end of 1988. Twenty years later the railroad refocused on Hampton Roads, after the APM/Maersk terminal (now Virginia International Gateway) was completed and container operations moved there from the Portsmouth Marine Terminal (PMT). the schedule for CSX trains at VIG is compressed by the national and regional schedules for passenger trains and to a lesser degree freight trains due to the mainline track capacity shortages between Richmond and Fredericksburg. The Port and CBP [Customs and Border Protection] have limited resources to support this schedule, resulting in reduced level of Port and CBP service for CSX cargo. At NIT, NS enjoys a competitive advantage as it owns a rail line leading directly into the NIT complex. CSX accesses NIT utilizing the Norfolk and Portsmouth Belt Line Railroad (NPBL), which was formed over 100 years ago by the Class I railroads (of which, NS and CSX are the sole remaining shareholders) to improve level of service to rail-served industries in Hampton Roads. This introduces additional rail operations for CSX to access the terminal. NS's advantage has thus far limited CSX rail demand at NIT to relatively low volume project, bulk, and break-bulk cargo. Shippers are attracted to ports that offer competition between railroads, allowing for negotiations to improve service and reduce costs. The Maersk Line shifted its business from Norfolk Southern to CSX in 2012 and started to ship containers to the CSX Intermodal North Baltimore terminal near Toledo, Ohio. 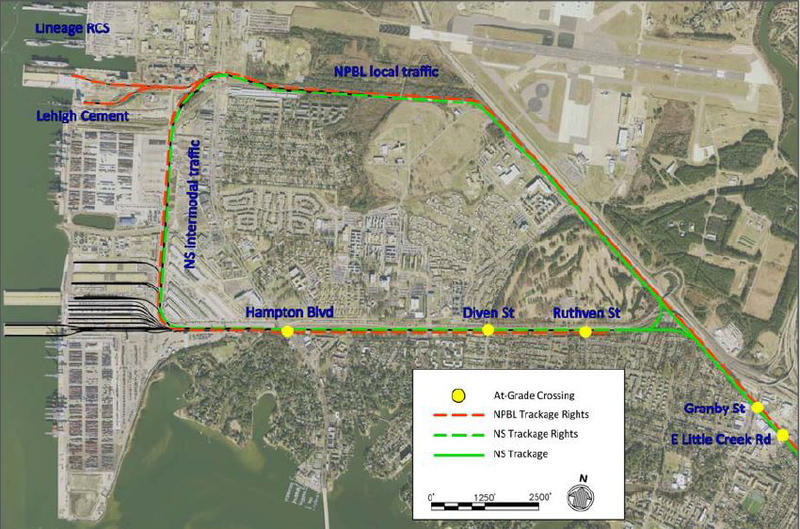 "Fair access" to the Port of Virginia terminals may not be in the interest of competing railroads. 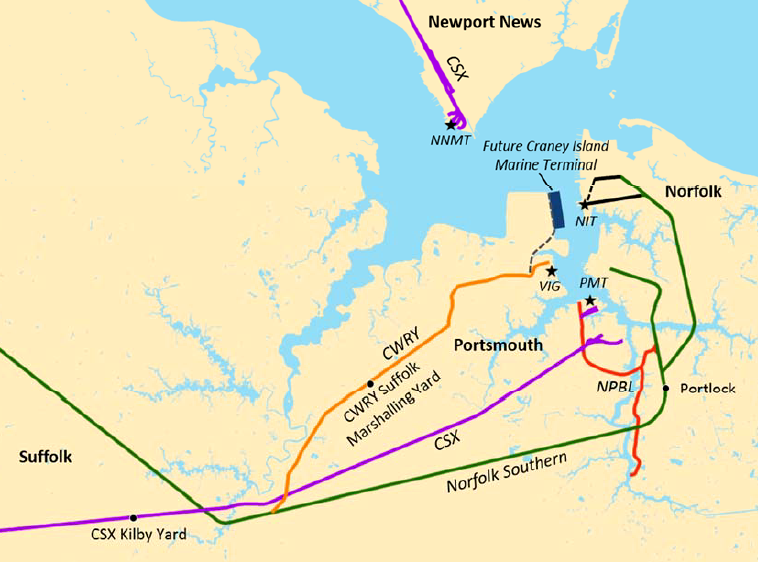 As a result of railroad mergers, Norfolk Southern ended up in control of the Norfolk and Portsmouth Belt Line Railroad. One clue to the dominance of one railroad: the Belt Line managers used Norfolk Southern email addresses and did not use the "@npblrr.com" domain. Our growth area is really in the Midwest... The rail hubs in Ohio and even to Memphis and Chicago and St. Louis � we've got the rail access to service that market.